I didn’t grow up observing Lent, and so have never really understood the motivation to give up things like chocolate. I have, however, come to understand the value of observing an expectant season; a time of anticipation and preparation. So this year, for my Lenten discipline I decided to go to church — every week — and then to brunch. It’s not exactly traditional, but it works in my head which is what matters. This year was supposed to be my great un-churched year. After making a major pilgrimage, singing in a Presbyterian choir, indeed spending the majority of my life in and around and about church, I was pretty sure I didn’t need more church in my life with its attendant commitments and responsibilities; if anything, I needed less. I’m a member of a vibrant community and have an active spiritual life. What more could church offer? It’s worth mentioning here that I didn’t just decide to go to church, but to go to a particular church. A leading parish in the Episcopal Church, one of the most distinctive buildings in the world, superior music, engaging teaching, Trinity Church in the city of Boston is about experiencing “More,” or so says Priest-in-Charge and former dean of the National Cathedral, Sam Lloyd. It’s also a bit of a trek from Salem. It’s true many Sundays I did not want to get up. One Sunday I missed my train, which are rare on Sunday mornings and took a bus for the first time since living in Salem. I was late but it was an adventure. And I was always glad to have arrived. To have made the decision to make the effort. I heard national voices like John Dominic Crossan and Lauren Winner intimately talk about parables and mid-faith crises. And then I went to brunch, read The Times, and made friends with the bartenders. And it was good. Even through Holy Week which I observed with abandon (Tenebrae, Maundy Thursday, the Good Friday three-hour devotion + Liturgy of the Passion, and the Easter Vigil), I’m not sure I was dramatically changed, though deeply enriched, surely. Come Easter there was no want for extravagance: fragrant flowers, grand anthems, exceedingly well-dressed Bostonians. I found it difficult to give in to the simplistic ecstasy of the festival atmosphere, though. I’d been through the darkness; I’d done the work, and I knew what was on the other side of all this hooplah. As I anonymously sang accompanied by trumpet and timpani these opening lines of the festive hymn, I couldn’t help but think that though that strife was o’er, strife remained. 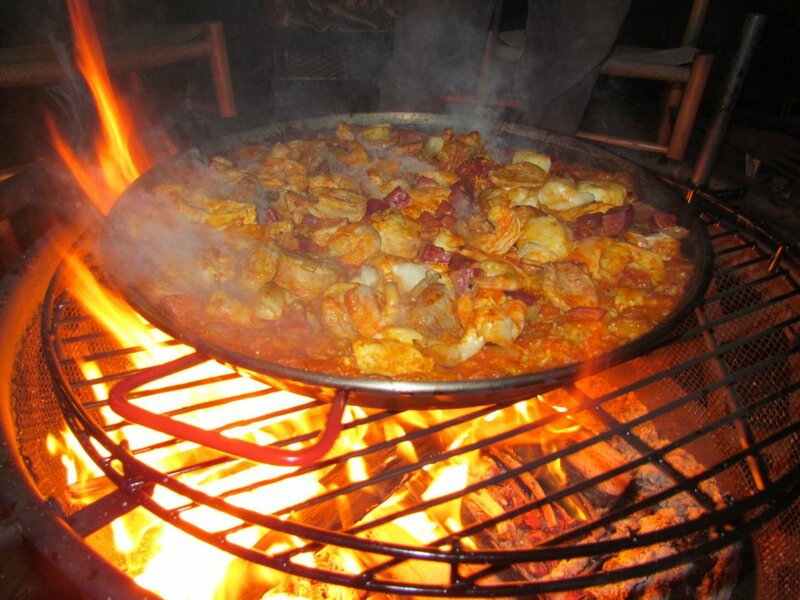 Indeed, I was anxious about getting home to light the Easter fire in the backyard and cook paella over it. I had a responsibility to my community. What will I do next Sunday? Maybe I’ll just relight the Easter fire and gather the community. Then again, I might just catch a bus into the city. Time will tell. Spending some time in Montana following an overflowing season in Naples…our daughter and son-in-law shared their Camino CD by Oliver Schroer, a violinist who carried his instrument the whole pilgrimage, recording along the way. Check it out if you don’t know it. And, it led me back to your blog. And, thanks for these reminders of Trinity Church. When at BU, we made routine pilgrimages there for so many reasons. I was struck 40 years later this spring with Brian Jones (Trinity Emeritus musician) made his own pilgrimage to Moorings Presbyterian based on the pipe organ I am now privileged to share. And, another good note, Moorings has now called Dr Doug Learned from National Presbyterian Washington DC who brings with him a zeal for Christian art–I believe the church’s brightest days are coming.